Tripp Lite's B022-U16 KVM Switch offers a secure way to control multiple computers from one keyboard, mouse and monitor, all In just 1U of rack space. Control up to 16 directly connnected computers, or expand the number of computers to up to 512 by daisy-chaining up to 31 additional B022-016 or B022-U16 KVM switches. USB/PS2 combo KVM cable kits allow you to connect to either a USB or PS/2 computer without the need for separate cable kits. Easily switch between the connected computers using the front panel push buttons, on-screen display (OSD) or keyboard hot key commands. Share a USB peripheral (flash drive, external hard drive, etc.) amongst the connected computers via the USB 1.1 hub port on the front of the unit. 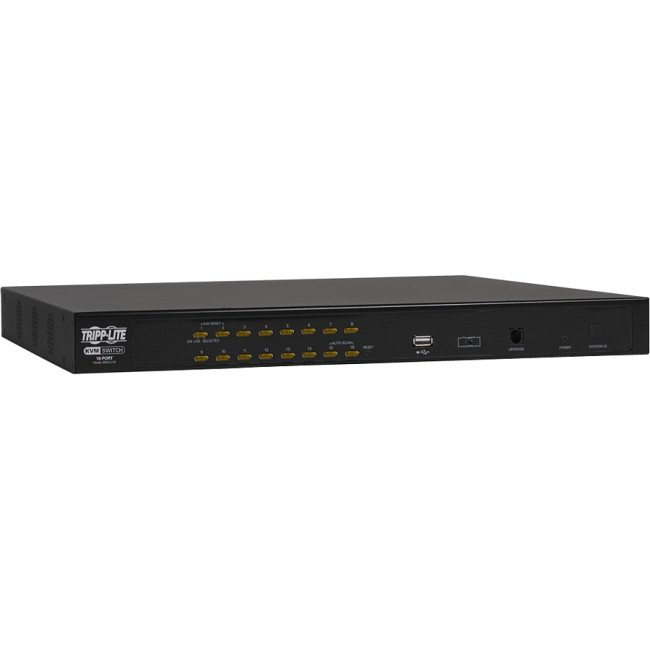 Add IP accessibility to the KVM switch and connected computers by connecting a Tripp Lite B051-000 IP Remote Access Unit. Other features include two levels of password protection (Up to 4 Users and 1 Administrator) and an Auto Scan feature that allows for monitoring of connected computers without having to manually switch between them. Compatible with all major operating systems. Constructed of heavy-duty steel housing. 1 year limited warranty.